From The Independent: Vogue editor-in-chief Anna Wintour has said it’s important to “take a stand” when deciding which influential women in politics the magazine features on the cover. Wintour was interviewed by CNN ahead of the Met Gala, which is scheduled to take place in less than a month’s time on Monday 6 May. During the interview, the Condé Nast artistic director was questioned over the women in politics who she chooses to profile in the magazine, having previously featured former first lady Michelle Obama and US senator Kamala Harris. “If you’re talking about the first lady or senator Harris, obviously these are women that we feel are icons and inspiring to women from a global perspective,” Wintour said. Wintour added that in the present political climate, she believes it’s important to “take a stand”, and that she doesn’t think you can “try and please everybody all the time”. “You have to stand up for what you believe in, and you have to take a point of view,” the 69-year-old said stated. CNN anchor Christiane Amanpour pointed out that the American magazine has featured more women from the Democratic party than the Republican party. “We profile women in the magazine that we believe in the stand that they’re taking on issues. We support them in the fact that we feel that they are leaders,” Wintour said in response. The Vogue editor-in-chief stated that the defeat of Hillary Clinton during the 2016 US presidential election made it even more apparent that more women are needed in leadership roles. 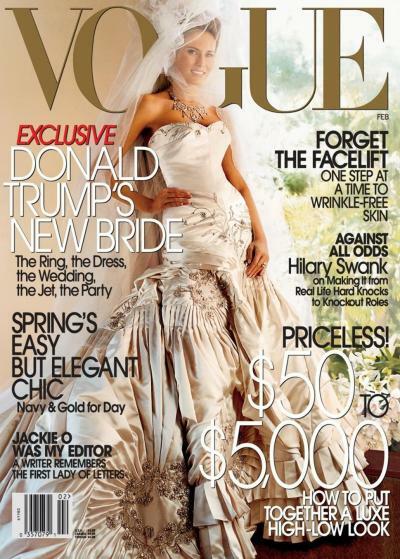 In December 1998, Clinton became the first US first lady to be featured on the cover of Vogue, during her husband Bill Clinton’s tenure as president.